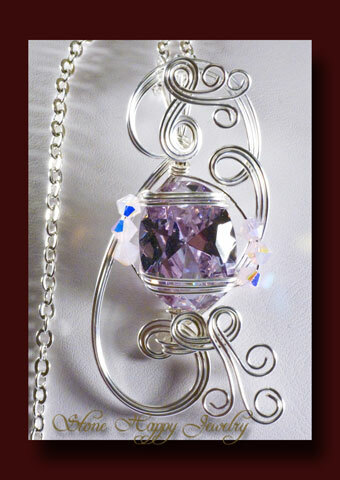 Such a pretty faceted lavender cubic zurconia wrapped in non-tarnish silver plate wire. 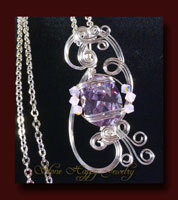 To add just a little sparkle, there are pink opal aurora borealis Swarovski beads on either side. The full length of the wrap is 2 1/4 inches and then there is a silver plate chain included as well at 18 inches making it ready to wear or give as a gift. The lavender is a medium tone and so will work in any season. Surprise yourself with some lavender sparkle!